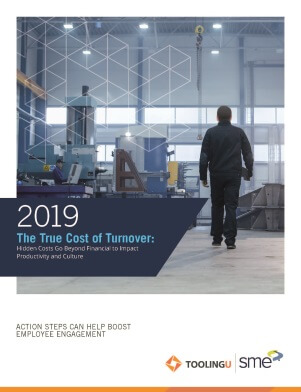 Tooling U-SME released a report, titled “The True Cost of Turnover: Hidden Costs Go Beyond Financial to Impact Productivity and Culture,” which explores the damaging impact of the cost of turnover to manufacturers. According to the report, voluntary turnover costs organizations from hundreds of thousands to millions of dollars. The report also outlines the sources and causes of turnover; significant financial loss and unwanted business challenges if not managed properly; and concrete steps organizations can take to reduce their turnover.